Richard Gomez taught Juliana to drive at 15, but can she date only when she’ s 40? ‘More like 39,’ Juliana says. 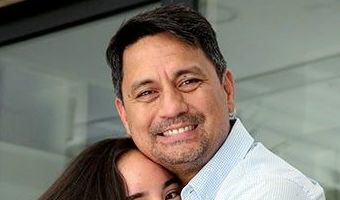 Richard Gomez and his unica hija Juliana have many things in common — that MVP gene as athletes and “our whole face,” as she puts it — combined with mother Lucy Torres-Gomez’s statuesque beauty and grace; it’s no surprise that the boys are already lining up for their only girl’s heart and she’s not even 18. For example, the question of whom Juliana might bring to prom was the talk among her peers in the weeks leading up to it. “You can’t date anyone less than Richard Gomez,” one "it" girl, recognizing another, gave as her unsolicited advice, but that’s not very helpful. Goma epitomizes the trifecta of the perfect man — tall, dark and handsome — as the pioneering Bench model, the ‘80s matinee idol and actor, the fencing gold medalist, and now, the beloved mayor of Ormoc, making strides in gearing up the city for progress; he’s also a visual artist, … [Read more...] about Richard Gomez taught Juliana to drive at 15, but can she date only when she’ s 40?